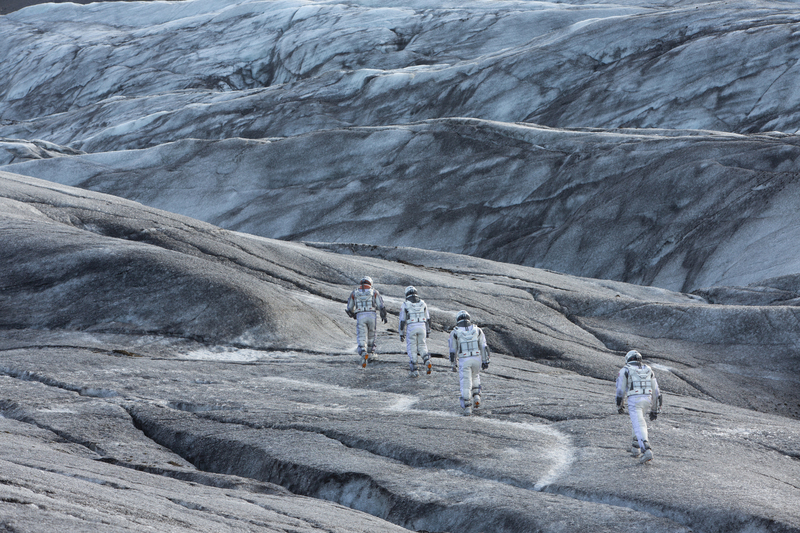 The director of The Dark Knight and Inception has turned to intergalactic space travel for Interstellar. But has he left comic-book movies behind for good? 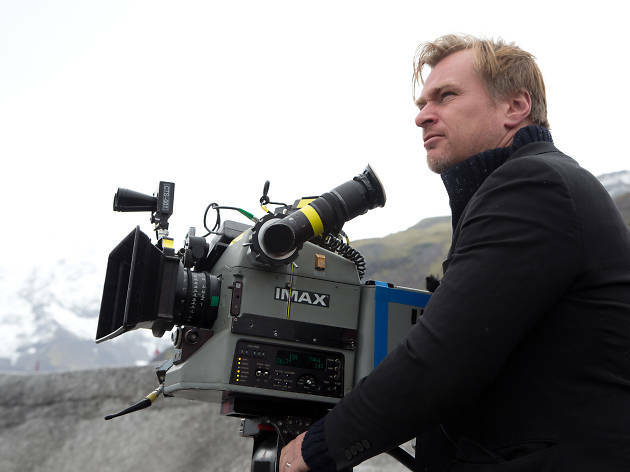 In the movie world, Christopher Nolan is the bridge between obsessive fanboys and serious film types. 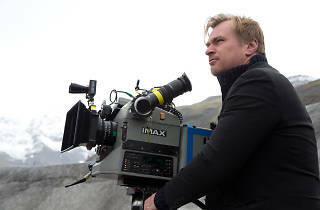 He’s the 44-year-old London-born writer-director who turned comic-book movies on their head with his Dark Knight trilogy, a brooding take on Batman that retained the cocksure intelligence and visionary edge of his earlier films like Memento and Insomnia. With 2010’s Inception, Nolan showed that big-budget sci-fi could be both smart and popular, and now with Interstellar he’s taken that maxim deep into outer space with a strange, epic tale that sees Matthew McConaughey and Anne Hathaway as two astronauts charged with finding a new planet to house a dwindling human race. I meet Nolan in Los Angeles, where the filmmaker lives with his wife and producing partner Emma Thomas and their four young children. He’s known for demanding the utmost secrecy around his movies (“privacy,” he prefers to call it), the effect of which is that he himself is often thought to be mysterious or tight-lipped. He certainly doesn’t look like a creative recluse. If you bumped into Nolan in a hotel elevator, you might mistake him for a polite middle-aged lawyer on a city break—smart shirt, jacket, good shoes. It’s only when he starts talking that you remember you’re in the company of a man who has Hollywood executives and film geeks alike hanging on his every word. If he’s Bruce Wayne, his movies are Batman: the adored public face of an anonymous guy who just wants to get on with his enigmatic work unhindered. You’re now an old pro at releasing movies on the back of enormous hearsay and rumor. Have you gotten used to it? It never gets any easier. You always feel that if you’ve created a lot of hype then you’ve created unrealistic expectations. The truth is, there’s only one way to sell an enormous film: We’ve spent a huge amount of money. You just have to bang the drum as long as you can, as loud as you can. It’s certainly daunting, but you do the best you can and put it out there. You’re often described as the “mysterious” Christopher Nolan, and now we have the “mysterious” Interstellar. You don’t look especially mysterious. I know! I’ll usually be asked about the mystery surrounding me when I’m on my 80th interview for a film. What more do I have to do? Do I literally have to strip myself naked? But I’m fine with that reputation. Anything that increases the mystery and drama surrounding the release of a film is great. I think it serves to heighten expectations. You risk disappointment but it makes it more exciting to go and see a film. Anticipation is a big part of showmanship: Ignore that at your peril. Does the sense of mystery come from you? Do you demand an extra level of secrecy for your films? I wouldn’t say secrecy—more privacy. In any creative endeavor, you need privacy. I need to be able to bring my ensemble of actors together. It’s like rehearsals for a play. You don’t invite people to watch your early rehearsals. That’s the fun of it. Where it’s possible to involve other people, you do, but a lot of it has to be very private. Think of it as a magician preparing a stage show. You don’t want to show everyone everything beforehand. They’ll see the tricks. Your films might be huge, but they’re also family affairs. You produce with your wife Emma Thomas. You write with your brother Jonathan. Do you have to build a wall between family and work? We try! It’s a pretty feeble wall. It’s more of a beaded curtain. There’s no wall. It’s very difficult not to carry the work home, and Emma is more sensitized to that than I am. And every now and then I have to make the point that we’re able to do what we love. So if it becomes a bit obsessive and bleeds into the home life, it's not the worst thing in the world. I actually had to drag my kids to work this morning because we didn’t have a babysitter. We were getting in the car and they were moaning about coming, which sometimes they do and sometimes they don’t, depending on whether there’s catering. And I said to them: Look, you have to come to work with your mum and dad. Just be thankful we’re not coal miners. I feel a big responsibility because we’ve been given opportunities that other filmmakers would kill for. So you have to use it for something. As long as there’s sincerity in the work and a sincere desire to challenge, I think people will respect that. My attitude to the audience is very simple. I am the audience. We are the audience. And any time there’s any sense in a meeting of us and them, that’s ridiculous. Did you watch Gravity through closed fingers last year when you were making your own space movie? I sheepishly admitted to Alfonso [Cuarón, the director of Gravity] when I had dinner with him during the awards season last year that I was probably the only person on the planet who hadn’t seen it. I said to him: I can’t watch another great sci-fi film while I’m trying to do my own thing. I’m looking forward to seeing it in a month or two. To me, I’m still making this film, and getting it out there is the last stage. 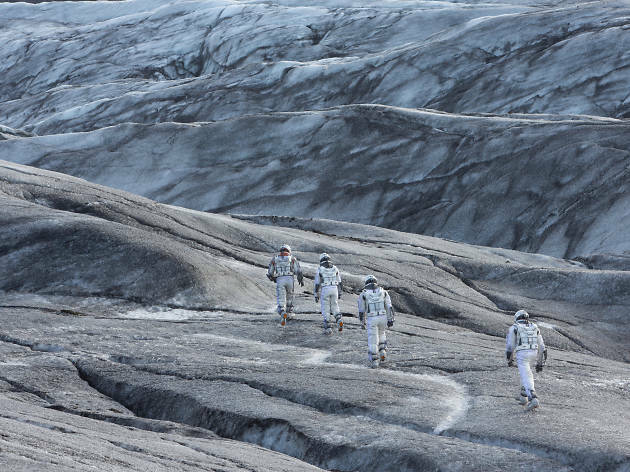 With Interstellar, did you know what sort of sci-fi film you definitely didn’t want to make? No, I didn’t actually. Sometimes I do think that—a feeling of traps to avoid. But it wasn’t so much thinking about what I didn’t want to do as asserting the credentials of the film we were making. Put it this way: There’s a scene early on in Interstellar when the spaceship is docking with the ring module [another spaceship] and we make a lot of it. There are two types of sci-fi film: the type where those mechanics are difficult and dangerous and you’re in there with the nuts and bolts, and the type where you see the spaceship and then they’re quickly off into warp drive and the universe. Both are valid, but I needed to let the audience know which journey we were on. Yeah, definitely, but I have pretty broad taste when it comes to movies. For me, you have to be in love with what the experience will be for audiences. That’s essential. Oh yeah. I go through a fallow period when I’m working. I can’t watch new films when I’m working. All I see is process. It falls apart on me. I’m okay watching old movies, but still everything becomes a bit mechanical. It’s very hard to enjoy a film when you’re constructing one. So I’m very much looking forward to getting back out there and catching up what with what I’ve missed. Do you go to the movies a lot? Very much, as much as I can, but I have a nice theater at home too, so I watch a lot of classic films on Blu-ray with my kids. We watched Lawrence of Arabia last weekend, which was a great Sunday afternoon. I do get out to the cinema as much as possible though. Do your kids share your passion for movies or just grumble at their dad’s obsession? My children are extremely good film-watchers. They’ve seen a lot of classic movies and I’ve imposed a lot of great movies on them. My only fear is that I’m unwittingly raising a generation of film critics. For a filmmaker? That would be hard. I don’t want to sound antagonistic to reviewers, but it would be an interesting relationship between a filmmaker-parent and a child who’s a critic! After the success of The Dark Knight films, there’s no end in sight to comic-book movies. Do you ever feel you’ve spawned a monster? Ha! Yeah, I love working in that field and hopefully I’ve added something to it. I know to some extent we encouraged more of it. You don’t want Hollywood to hit saturation point with those things. But then Zack Snyder is now doing his part by bringing Batman and Superman into one film [for 2016’s Batman v Superman: Dawn of Justice], so that limits the number! But yes, DC Comics have just announced an enormous number of movies. Well, you know, as long as that’s the ride people want, the studios will continue to offer it. I don’t see it as a limited genre. If I did, I never would have worked for almost 10 years in it. I think like any genre, like the Western, it has limitless opportunities. It’s just about the audience’s appetite. What’s very important is that the studios be open to making other sorts of films at the same time. So you’re not about to direct a Marvel movie or another DC Comics movie? I feel very, very proud of being involved in that performance, and it really was a collaboration. But I hesitate to take too much credit for it because Heath really was a self-starter in that regard. We talked a lot about reference points and I tried to free him up with the tone. But he really came up with the goods on that one. I’m very proud to be involved with that. I would love to think so. It’s not really for me to say, but it was the ambition for the films, definitely. When you work in any genre, you’re looking to transcend it. You don’t make a genre film wanting to make a retread or parody or satire. You’re working in a particular constraint but you’re looking to force that box to be a little wider. Is there a genre that scares you too much to give it a try? In a funny way I think you gravitate to subject matter when you’re ready—not necessarily completely ready, as you want to be scaring yourself and challenging yourself a little bit. So there are all kinds of films that I look at and think: That would be terrifying to do. But maybe that just means you’re not ready for it yet. Interstellar is not a film I could have made 10 years ago. It really isn’t. But 10 years ago I didn’t want to. You change and grow through making films and getting older. I’m such a fan of some of the great science fiction of the past, like 2001: A Space Odyssey, so to go there was exciting but also extremely daunting because it’s been done so well in the past. Also the emotion of Interstellar was really important to me but also very frightening. I wrote a speech for Anne Hathaway about the nature of love and I looked at it and thought: I should cut that out. I’m terrified of it and I don’t know how to pull it off. But she did it and it’s very important in the film. That’s what great actors can do for you. The movie wears its emotions on its sleeve, and when you’ve worked in the genres I have, you have ways of sidestepping genuine emotion if it makes you uncomfortable. There’s a scene with Matthew McConaughey I find completely heartbreaking and he performed that with a rawness on the first take. It’s not something I’ve ever put into any of my films. There’s a little more theatrical distance to most things I’ve done. Where would you say Interstellar sits in relation to Kubrick’s 2001: A Space Odyssey? It’s clearly a huge influence. I put it this way: The shadow of 2001 hangs over anything vaguely in this genre. You’re daunted by it but also inspired by it. This is absolutely my attempt to recreate the feeling of going to see that film with my dad when I was seven at the Odeon in Leicester Square in London when it was re-released. That feeling of otherworldliness. That scale. You can’t make this film pretending 2001 doesn’t exist. You have to embrace it. There’s no way not to. You have to just dive in. It’s a touchstone of the genre and you have to make the film knowing that. Christopher Nolan’s overwhelming, immersive and time-bending space epic Interstellar makes Alfonso Cuarón’s Gravity feel like a palate cleanser for the big meal to come. Where Gravity was brief, contained and left the further bounds of the universe to our imagination, Interstellar is long, grand, strange and demanding—not least because it allows time to slip away from under our feet while running brain-aching ideas before our eyes.